Posted on March 23, 2015 by E.M.
Buenos Aires is a city of almost 3 million people (14 million in the metro area!) so my first impression wasn’t that great: lots of concrete and traffic like any other metropolis. However, after doing a city tour with the group, I found many places worth seeing. 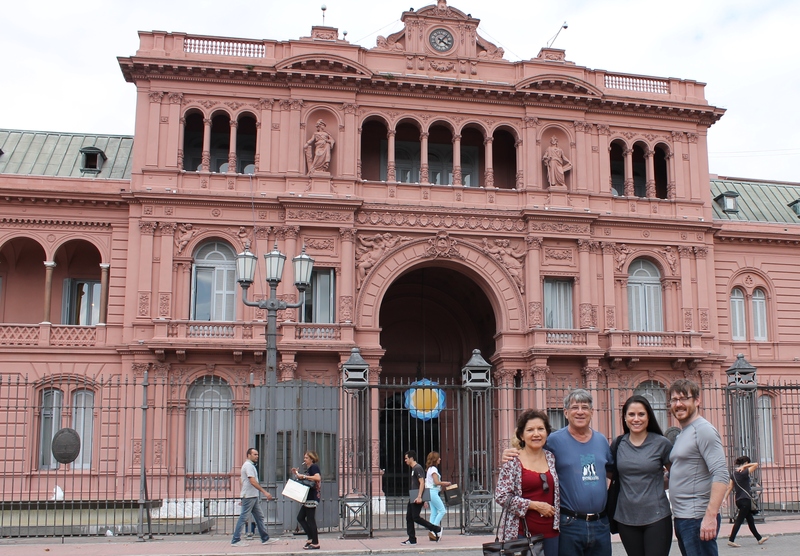 To hit many landmarks at once, we headed to Plaza de Mayo, a city square that celebrates the 1810 Mayo Revolution, a movement that started the independence process. There, once a week, the moms of Madres de la Plaza de Mayo still meet to protest against the disappearance of children during Argentina’s Dirty War in the 70’s. Facing the plaza is La Casa Rosada, Argentina’s White House. This not where the president lives, but it is where she works. Christina Fernández de Kirchner has been involved in a lot of scandals lately, so she did not make an appearance at Evita’s famous balcony when we were there. Speaking of Evita, the late former first lady is celebrated everywhere from murals on buildings to statues on plazas. Also near Plaza de Mayo is the Catedral Metropolitana, Buenos Aires’ main cathedral. Inside it’s just like any other church in South America, full of sculptures and gold, but outside it doesn’t have any towers, but a classical colonnade. This is a very historical building as well: it houses the mausoleum of independence war general San Martin and it’s the church Pope Francisco came from. An unexpected tourist attraction in Buenos Aires is a cemetery. La Recoleta has beautiful mausoleums and graves and one can get lost looking at all the details of each. It is also the home of late presidents, Nobel Prize winners, and Evita Perón, who is buried in the Duarte Family mausoleum. As far as shopping, Buenos Aires has many options. Calle Florida is a pedestrian street with lots stores, including shady money exchange places: all you hear is “¡Cambio!” (“change”) all day long. Nearby is Galerías Pacífico with high-end stores and murals from famous artists like Antonio Berni. Then for some culture, it is good to check out El Caminito in the neighborhood of La Boca, where its colorful buildings give an exciting feeling to the area, which is packed with street artists. Argentina is also a synonym for tango. This sensual Latin dance was born in Buenos Aires in the 1890s and exploded in the world in the 30’s with Carlos Gardel. 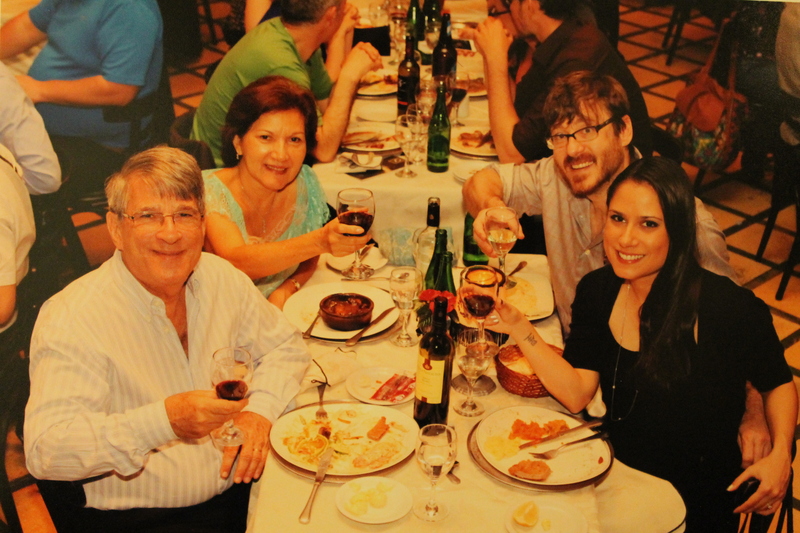 Many places in the city have traditional tango houses called milongas, but we went to a dinner and a show option at El Querandí, where several couples and a live band went through the history of tango while a three-course dinner was served. We only had a few days in Buenos Aires, but I feel we experienced the best the city has to offer.